specialists and general dentist can satisfy your dental needs gently, efficiently and comfortably. Periodontist Dr. Lee Sheldon has provided comprehensive implant, periodontic and full-mouth rehabilitation dental services to area residents for over 30 years. Dr. Sheldon has served in leadership roles in various dental organizations. He was the Chairman of the dental department at Holmes Regional Medical Center. He has chaired the Brevard Study Club since 1995, bringing dental continuing education to Brevard County dentists. And he was an associate clinical professor in the University of Florida College of Dentistry’s graduate department of periodontology for over eight years, where he helped train periodontists of the future. He, along with our office manager, Danyel Salmella, are founders of the Institute for Dental Specialists. They have lectured at national and regional periodontal meetings in nearly every area of the U.S.A.
Dr. Sheldon was the first dentist from central Florida to use computer-guided surgery for implant placement. He was also the first to use the dental endoscope to assist in the effective nonsurgical treatment of gum disease. These innovations have led to the Solid Bite concept, providing beautiful, functional and efficient dental restorations. Do you feel that there are no dental answers for you? Drs. Sheldon, Sheldon, and Furtado have authored the book, "The Ultimate Mouth Manual," available in book stores (downloadable for free here), which contains information patients need to make dental decisions in the 21st century! Dr. Sheldon is also a regular contributor to the column, “Focus on Seniors,” in the Senior Scene Magazine. His topics range from dental care to overall health care. You can read the articles he has written by clicking this link. He is also a regular panelist on the Focus on Seniors programs on radio and television, as well as a sought-after speaker on health care and nutritional topics. Dr. Matt Sheldon is an experienced and knowledgeable dentist who is here to help patients enhance their lives with crowns, bridges, veneers, dentures and cosmetic dental care. Dr. Matt Sheldon received his Bachelor of Health Science at the University of Florida and went on to earn his Doctorate of Dental Medicine at the renowned Tufts University School of Dental Medicine. He also earned a Certificate in Advanced Education in General Dentistry from Texas A&M Health Science Center. To keep up-to-date on the latest technology and treatment options in dentistry, he is committed to continuing his education in order to provide the most effective and minimally invasive dental care possible. He continues to take advanced courses at both the Pankey Institute in Key Biscayne, Florida and Spear Education in Scotsdale, Arizona. Both are world-renowned for their comprehensive approach to full mouth dentistry. Dr. Matt enjoys working out, traveling, watching and playing sports and spending time with his family. He married his high school sweetheart, Jenifer, and they have two children. 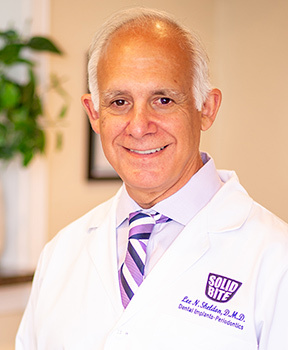 Dr. Furtado shares the same passion for patient-centered care and state-of-the-art periodontal and implant therapy that Dr. Sheldon has become known for. Dr. Furtado enjoys the challenges of the ever-changing fields of periodontal and dental implant treatments. His commitment to providing the highest quality periodontics is a great asset to our office. Dr. Michel Furtado obtained his Bachelor of Dental Surgery in Brazil in 2003. Since then, Dr. Furtado has dedicated considerable time to active research activity and its application to Clinical Dentistry. His academic work was presented at international conferences and culminated with the licensing of a patent on the formulation of a gel for the controlled release of antimicrobials to be used in periodontal surgery. In 2008, Dr. Furtado completed his Master of Science degree at the University of Toronto in Canada under the supervision of Dr. John E. Davies (world leader in Bone Biomaterials and Stem Cell research). During his time at the University of Toronto, Dr. Furtado held the position of teaching assistant in Oral Biochemistry, Head and Neck Anatomy, and Bone Interfacing Implants. 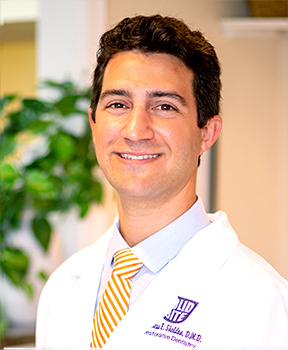 Dr. Furtado completed his specialty residency in Periodontics and Masters in Dental Science at the University of Connecticut (UConn). During his time at UConn, Dr. Furtado received the Auxiliary Scholarship Award, a great honor given to the top residents among all specialty programs. In addition, Dr. Furtado’s clinical research was selected as one of the four finalists at the prestigious American Academy of Periodontology Orban Competition. 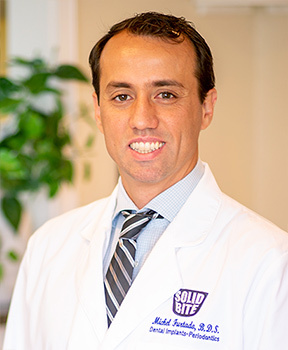 Dr. Furtado has published eleven scientific articles in peer-reviewed journals, including Clinical Oral Implants Research, Biomaterials, Clinical Advances in Periodontics, and Dental Materials. For the three years of his specialty training, Dr. Furtado’s interdisciplinary approach (with general dentists, endodontists, prosthodontists, and orthodontists) honed his skills in the treatment planning of complex and comprehensive clinical cases. In addition, Dr. Furtado obtained advanced training in conscious sedation (intravenous and oral). Dr. Furtado also has the distinction of Diplomate of the American Academy of Periodontology as a Board Certified Periodontist. Dr. Furtado is our surgeon. As a SolidBite team member, he enjoys being part of our patients’ treatments from start to finish. Dr. Furtado enjoys traveling, music, chess, and soccer. When not in motion, Dr. Furtado loves spending time with his beloved wife, Michelle, his daughter, Alice and son, Ian.